You’ve been guzzling down giant mugs of chamomile tea; you’ve tried a bit of guided meditation; you’ve even switched up bright screens for a bedtime book! You know that quality sleep, or lack of, can affect everything from your appetite to your immune system, and ain’t nobody got time for that annoying head cold, right?! There’s a lot of things that we can do to improve our time under the covers, but one key factor that often gets overlooked is diet. For obvious reasons, excessive caffeine and/or sugar can easily set the stage for poor quality snooze time. These bad boys will throw your adrenal glands in to a spin, often resulting in a long night staring at the ceiling, or tossing and turning until the alarm goes off. But rather than focusing on the things we shouldn’t be doing, let’s take a look at 4 sleep-enhancing foods and how to turn them into a cheeky little taste bud delight. Because, well, I heart dessert! Bananas are one of my all time faves! Have you ever tried freezing one and eating it as “ice-cream”? SO GOOD! These little gems are a great source of potassium and vitamin B6, both which help to relax the nervous system encouraging a better sleep throughout the night. They also promote serotonin production (your feel-good, relaxing chemical!). Almonds – especially the soaked kind – are a great little source of magnesium which is well known for it’s many functions inside the body, including it’s ability to calm the nervous system and aid in muscle relaxation. I could go on about Magnesium for hours, but let’s save that for another day so we can get to the tasty part, yeah?! Cherries – excluding Dr Pepper (sorry!) – not only help to reduce inflammation in the body, but also offer a great little hit of melatonin. Melatonin helps to control your sleep/wake cycles, making it a star player in the quest for happy, healthy sleep habits. Cacao – not that you needed another reason to love chocolate – is high in magnesium, which we now know is a strong promoter of quality sleep. HOLD UP! This isn’t permission to get out there and eat your bodyweight in sugar-laden chocolatey treats. (Fun police, I know!). Not all chocolate is created equal, and even the dark kind can sometimes be filled with hidden additives which may in fact stimulate you rather than calm you down. Make sure you choose quality, organic dark chocolate; or even better – make you’re own! Ok, now let’s get to the good stuff! 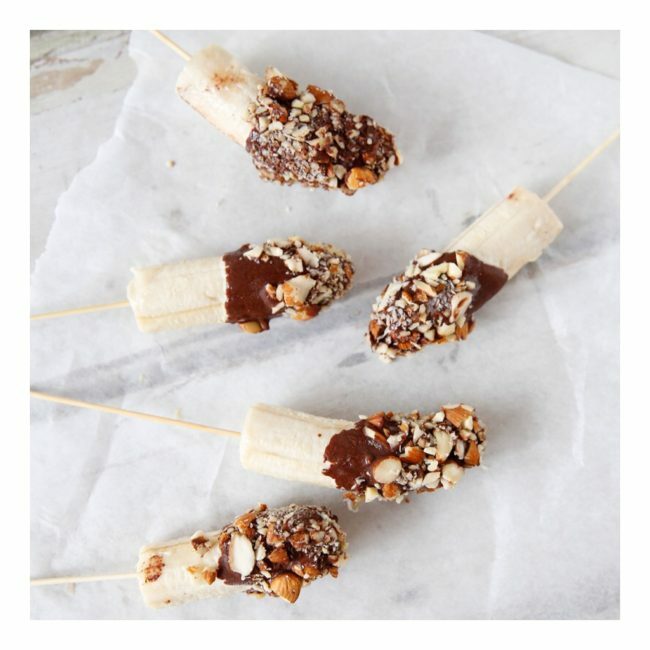 Introducing one of my favourite desserts – including banana, almonds, AND cacao: Frozen Banana Pops by A Conscious Collection. So. Friggen. Good! Great as a snack on the run or perfect for a yummy, super simple dessert; these guys won’t disappoint! ➕ Consider removing the maple syrup if you’re eating these at night or if fat loss is your goal. Although the amounts are minimal, it’s important to remember that sugar is a stimulant and it also fuels the craving for more sugar. Let the banana be your sweetener and keep the rest to a minimum where you can. ➕ You can use the same recipe (above) with cherries! Simply make your chocolate, cover your cherries, and line them up on a tray in the freezer until the chocolate has set. So easy! YUMMM!